First time in Moscow? Discover the best of Russia's capital on a 3-hour insider walking tour with an expert guide. Admire the colorful domes of St. Basil’s Cathedral, which sits on Red Square below the ramparts of the Kremlin. Explore the Kremlin walled complex of domed cathedrals and palaces, which hide a lot of wonders . Stroll along the streets of neighboring Kitai Gorod which rivals Red Square in architectural beauty. And look at historical downtown from bird’s eye observation deck. You’ll see top attractions like GUM department store, the Bolshoi Theater and neighborhood gems like Nikolskaya and Christ the Saviour Cathedral. As you walk, you'll learn the history of this contemporary city and its ancient roots. 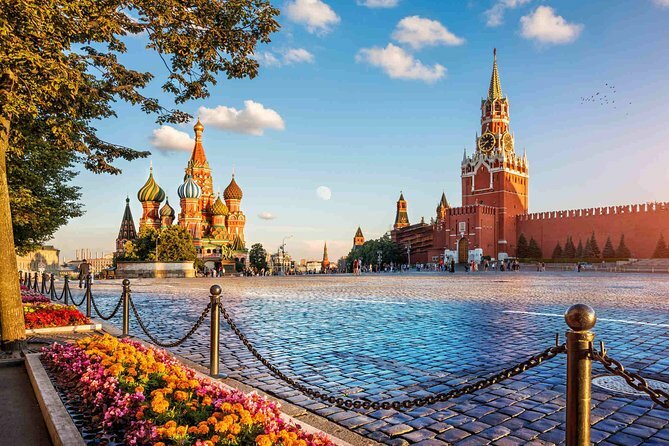 ● 3-hour walking tour of Moscow with an expert guide. ● Explore the Kremlin fortress by walking along its walls, look at the working residence of the President of Russia and try to guess if he is in the office today. See the Kremlin's most iconic gate, the Savior Gate and make your step in Red Square. Enjoy the breathtaking view of St Basil Cathedral. Observe Lenin's Tomb, Lobnoye Mesto and the Monument to two national heroes Minin and Pozharsky. Visit GUM department store and try the best of Moscow ice-cream, walk along the fairy tale Nikolskaya street and feel the vibrant atmosphere of the big city. ● Take picture of notorious KGB building and observe Moscow's historical centre from bird's eye Detsky Mir rooftop. Go out to Revolution square and see the change of Kremlin guards near the WWII Memorial in Alexander Garden and complete your tour near Christ the Saviour Cathedral and breathtaking view of the Kremlin from Patriarch's bridge.